We all know the type. Ten minutes before you have to leave, they decide to start the laundry, or wash their hair. Or, maybe they just can’t wake up in the morning on time. They hit the snooze 17 times to instill panic solely to be able to get up. Being that I AM one of these wretched people who are always late, I’ve put together this gift guide of things that help me manage my time a little better. 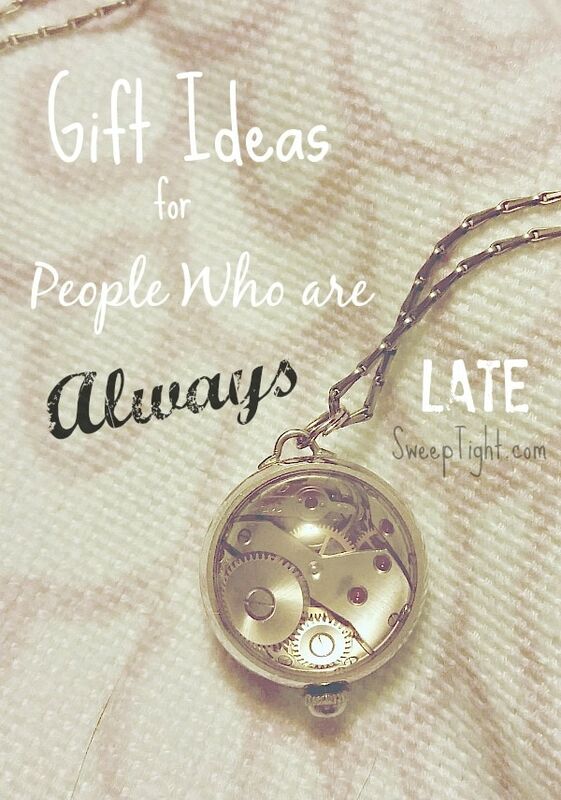 It might be that figuring out why they are always late will lead to the best gift. Sleepy Heads. If they struggle with getting enough sleep or being able to get up on time, the right alarm clock can be a huge help. The BioBrite is my all time favorite. With a sunset and sunrise right next to my bed, it helps regulate my natural circadian rhythms. Time MIS-managers. Time management is one of my biggest struggles everyday. I know many people work very well with an online calendar but I’m the type of person who needs it all laid out in front of me. I love my planners–they end up being like a journal that I save too. With a perfect planner, you also need the right color-coordinated pens. Personally, I love vibrant super thin, Stabilo marker pens–they don’t bleed to the other side of the page at all! Fun paperclips are also a fun way to hold important pages or keep coupons for shopping. Another way to help manage time is to set timers for each task. I love my cube timers. You simply put them on the side with the amount of minutes and they start the countdown. I use these to make sure I don’t spend an ENTIRE day checking email, for cleaning, and for getting ready in the morning. Knowing I have a set time helps me stay focused and realistically set goals for the day. Time? What’s that? Most of us have smartphones and use them as time keepers, but sometimes the feel of a watch makes you more aware of where the day is going. Plus, it’s a great excuse to make a fashion statement. We are, of course, partial to the Starling Pocket watch for its glorious Disney steampunk design and glowing lights. It happens. Sometimes you’re just going to be late. Weather, traffic, just one of those days… whatever the case, you can always be prepared to be apologetic about your tardiness with cute creatures that are sure to make anyone smile. Apuglogies are a sure fire way to forgiveness. You could always show up in a funny shirt for people who are always late. Let us know if you have any other cool products to suggest to buy for people who are always late! Who do you know that is always late? I have a friend who is just about always late. She even puts alarms on her phone but they don’t seem to help. i feel like you wrote this for me!!! I hate being late so I’m usually early or right on time. I feel that it is a courtesy to others to not keep them waiting.